The preamble or prehistory to the Russian Revolution can be traced back to the late nineteenth century, when the vast empire began to undergo radical changes that outstripped Tsarism’s capacity or inclination to adapt accordingly. The three decades prior to the war saw Russia experience significant economic growth as a result of breakneck industrialisation, increased foreign investment, the emergence of a modern banking system and the promotion of a small indigenous enterprise sector. National income grew rapidly in these years, yet this growth was distributed unequally between the economic core and periphery as well as along class lines. At the same time, liberal pressures in the direction of constitutional monarchy elicited a combination of reform and repression on the part of the autocracy, generating successive political crises that gradually eroded its power and legitimacy. It was in this period that the Russian working class grew in numbers and confidence. Despite or perhaps because of the weakness and effective illegality of the organised labour movement, Russia experienced four waves of mass strikes in the lead up to the war – the first in the late 1870s, the second in 1896-97, the third in 1903-06, and a fourth beginning in 1912. Rising workplace militancy and the strength of radical political sentiment confounded orthodox Marxist diagnoses of Russia’s backwardness and pointed to at least two key factors that would ultimately make revolution possible. Firstly, the government’s large stake in native industry and the protection of foreign investment meant that modest economic demands such as improved wages or working conditions were always likely to turn political, with the authorities quick to use violence in the defence of commercial interests. As Neil Faulkner notes in his popular account of the Revolution, workers learned from experience that ‘economics and politics were inseparable: that when one fought the boss for a living wage, one faced the truncheons and sabres of the Tsarist state.’ These struggles, he argues, ‘turned the more determined of the proletarian militants into political revolutionaries’, creating an important strata of organic intellectuals. A second key factor was the predominantly peasant composition of the working class, whose experience of dispossession and tradition of violent rebellion against landowners made them more revolutionary than conservatively minded French smallholders, for example. With the abolition of serfdom failing to temper widespread demands for land redistribution, peasant revolts became a common feature of the Russian social landscape by the turn of the century. In addition, the large numbers of young peasants migrating to the towns and burgeoning industrial centres carried with them the radical traditions of their forebears, and bore what Sheila Fitzpatrick describes as ‘the resentments and frustrations that go with dislocation and incomplete assimilation to an unfamiliar environment’. These undeveloped modern dynamics reacted against the established order in the 1890s, when Russia’s industrial cities were hit by strikes much bigger than those of the late 1870. The strikes were supported by small socialist organisations such as the St. Petersburg League of Struggle for the Emancipation of the Working Class, whose founding members included a young V.I. Lenin and his close collaborator Julius Martov, a future leading light of the Mensheviks. This Marxist intelligentsia rooted itself in the urban working class through the establishment of reading circles and study groups, before progressing to political organisation and the calling of strikes. It was here that the foundations were laid for the emergence of Russian social democracy as a mass movement. And yet, the theoretical Marxist debates taking place at the time – on economism, on conceptions of the revolution, on the role of the party – were only as urgent or relevant as the masses rendered them in practice. For in 1905 the workers once again intervened into history, casting aside established Marxist doctrine and dealing Tsarism a near fatal blow from which it would not recover. It began at St. Petersburg’s massive Putilov steel works, with the sacking of four of its 12,000 workers at the end of 1904. To the workers’ petition for reinstatement Fr. George Gapon, a popular Orthodox priest with a socialist background, added demands for a wage increase and an eight-hour day. Radicals to the left of him then added further demands resonating beyond sectional interests: for the freedom of assembly and of the press, the separation of church and state, an end to the disastrous Russo-Japanese War, universal suffrage and a Constituent Assembly. 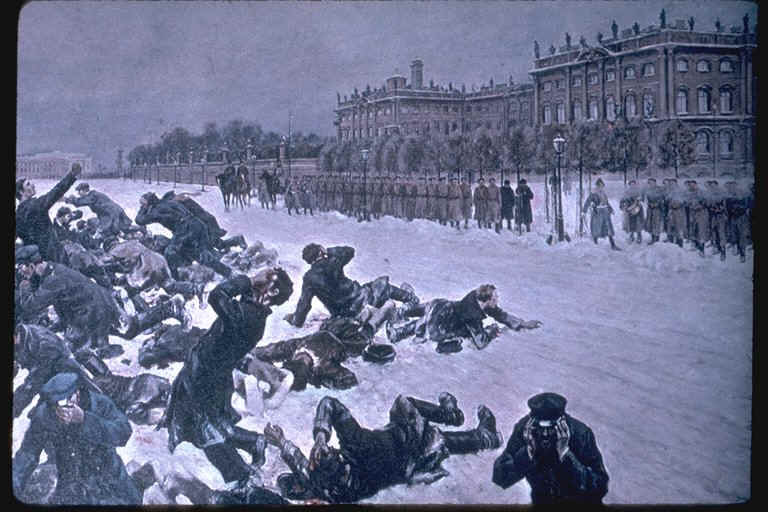 Bloody Sunday, 9 January 1905 in the Russian calendar, saw the Cossacks and police massacre up to 200 demonstrators outside the Winter Palace. What had begun as a popular campaign for liberal reforms was momentarily transformed into a movement of mass strikes, peasant insurrections and military mutinies, climaxing in the autumn with the St. Petersburg Soviet of Workers’ Deputies assuming de facto control of the capital. Panicked and wounded, the regime was able to bolster its chances of survival by ending the war with Japan and pledging the creation of a national parliament, the Duma. However, the nascent worker-peasant alliance continued to pose a threat into 1906, land seizures and soviets being the order of the day. The Mensheviks and Bolsheviks could legitimately boast a place in this movement. But notwithstanding Trotsky’s prominent role in the St. Petersburg Soviet, their respective assessments had been overtaken by events. Indeed there were lessons in this partial defeat for everyone in the revolutionary movement – about human agency, about solidarity and collective action, about the nature of the state, about political organisation, tactics and the need for a ‘concrete analysis of concrete conditions’. Right across the European socialist movement, internationalists became national patriots overnight. Even most Russian socialists adhered to the ‘defencist’ position of supporting the war effort while at the same time calling for its immediate end. But the war had the overall effect of accentuating the old regime’s anachronisms and weaknesses. In the first place, with the Russo-Japanese War still raw in people’s memories, each major defeat suffered by Russia during the First World War – and there were many – would cause society to turn against the hapless Nicholas II and his government, highlighting their illegitimacy. Secondly, the economic hardship caused by the war – high inflation coupled with low wages, and food shortages leading to mass starvation – heightened the sense of discontent felt by Russia’s vast population. In these harsh conditions the rapidly expanding industrial workforce grew more militant and strikes more frequent. And while the economic struggles continued, the political strike movement gained new momentum. Stories broke through of mutinies, of small groups of soldiers refusing orders to fire upon demonstrations; increasing numbers joined the burgeoning ranks of the revolution. This new development underscored one unintended but ultimately fatal consequence of the war effort: the coming together of Russia’s disparate and heterogeneous working class on the battlefield as well as on the home front. The working women of Petrograd were doubly oppressed: ground down in the workplace, by wretched conditions, long hours and low pay; ground down at home by the toil and poverty of everyday existence. Many were on their own, their brothers, husbands and sons conscripted. Many were grey with hunger and exhaustion. Sometimes they would go two or three days without eating. Sometimes they would cross themselves and weep with joy when they managed to buy bread. When a loaf can induce tears, revolution is close. By the close of International Women’s Day, the striking women had called out tens of thousands of workers from neighbouring engineering factories. Within three days virtually all of Petrograd’s major factories had been shut down. Over 300,000 people were now active in a political strike, the slogan ‘Bread’ crowded out by banners reading ‘Down with the autocracy!’, ‘Down with the war!’ Army regiments mutinied in larger numbers than before, with thousands of soldiers coming over to the revolution. Before long it had spread to Moscow and the provincial cities, leaving the Tsarist regime crippled beyond repair. According to Lars T. Lih, the prolific scholar of the early Soviet period, the February Revolution set up the ‘fundamental lines of force for the whole year’. The Romanov dynasty that had ruled Russia for centuries had collapsed, giving way to a ‘dual power’ situation in which the soviet – now comprised of worker and soldier delegates – gradually became the ultimate source of sovereign authority. On the surface, this power manifested itself in the Provisional Government’s adoption of key parts of the soviet programme and the loyalty of the armed forces to the soviet. At the same time, new trade unions were formed, with Mensheviks and Bolsheviks taking up leadership positions; and at a grassroots level, workers’ committees drew down economic power by assuming control of their factories. The struggle between the Provisional Government and the soviet found expression in a series of political crises that occurred between February and October. Membership of the Bolshevik Party increased from just 24,000 to over 350,000 in the same period, as the population grew war weary and economic conditions deteriorated. Strikes and workplace occupations played an important role during the July Days demonstrations, for instance, when most of the 500,000 demonstrators who came out did so under the Bolshevik banner of ‘All power to the soviets!’ General Kornilov’s attempted coup of August likewise failed in large part because of the actions of ordinary workers: railwaymen diverted trains bringing troops into Petrograd, printers halted the distribution of Kornilov’s plans, and soviet activists used their newfound influence on the soldiers to prevent wider bloodshed. With hindsight, the Bolsheviks gaining control of the Petrograd Soviet at the end of August and the Moscow Soviet a week later would seem to imply an inexorability about the Russian Revolution. The events of 25-26 October, both on the streets and behind the scenes at the Second All-Russian Soviet Congress, were much more chaotic and uncertain than this. Of Lenin, China Miéville has written that, ‘Reality, radical, now stunned him.’ However, the strength of the Bolsheviks’ position was that they had spent a year immersing themselves in the working-class movement, reformulating their tactics to confer with the shifting balance of class forces. When the Revolution came, they were able to hasten the transfer of power to the soviet and guide it towards implementation of a socialist programme. One hundred years on and we have in many ways come full circle. New fault lines are emerging and becoming increasingly threatening in the existing economic and political order. But with this comes possibilities that haven’t existed in years. Whilst the Russian Revolution cannot be taken as a blueprint, as the only way of building a new society, it nonetheless offers a number of positive lessons for those of us arguing for an alternative. Firstly, when we look at the history of how successful revolutions are made, we find that it means not merely lecturing at people or sloganeering – the ‘build it and they will come’ approach – but listening to them, learning from them and harnessing their experiential knowledge. It also means being involved in ongoing struggles, campaigns and forms of resistance which are objectively anti-capitalist even if they are not explicitly meant as such. Struggles for universal healthcare, the right to a home, a high quality system of free public education, for a sustainable environment, or against racist and gendered forms of oppression and the logic of privatisation and commodification – each of these, argues the Marxist geographer David Harvey, interrupts the circular flow of capital and represents an attack on the system as a whole. In addition, as the Right2Water campaign aptly demonstrates, participation in these forms of resistance can help trade unions to reconnect with communities and halt the sharp decline they have experienced in the past three decades. Secondly, while the system and human reality have changed in the past hundred years, the forms of oppression and exploitation they sought to overturn are fundamentally the same. The task of building economic and political power in workplaces and communities remains vitally important, particularly as the institutions of representative democracy are being hollowed out. 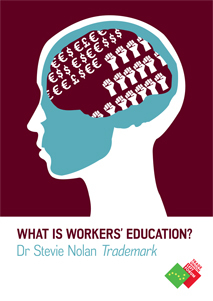 Already we are seeing workers in Ireland starting to push back against the onslaught that began in 2008, with the number and intensity industrial disputes growing year on year since 2012. But as the Russian Revolution and indeed the missed opportunities of the Irish revolutionary period show, industrial struggle must be complemented with direct political interventions and a political strategy for fulfilling our programme. Finally, the Russian Revolution shows that we must come armed with a positive vision for a better future and win the battle of ideas, over the course of a generation if necessary. In this regard, the British Labour Party manifesto and the role of Momentum in popularising Corbyn’s simple message underscore the potential that exists for a grassroots-led movement such as Right2Change. History records few occasions when masses of ordinary people overturned a system and took power. The ability to point to this, to draw inspiration and hope from it, is indispensible to confronting the challenges of the present. At the same time, it is crucial that we learn the harsh lessons of our own history – the missed opportunities of the revolutionary period, the disastrous legacy of social partnership, the historical roots and impact of sectarianism, the paralysing effect of left sectarianism, to name a few. If we can do this while sharing knowledge and experiences with contemporary social movements globally, then we will surely be giving ourselves the best chance of success.